A modern kitchen is more than just a place to prepare food. It's the heart of the home, somewhere to be with one's family and entertain guests, and it can also be a powerful lifestyle statement and a way of putting an individual stamp upon a property. 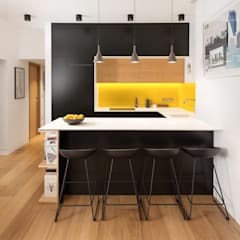 Now you can explore helpful hints on a broad selection ofmodern kitchen ideas at homify, the website that is your portal to a world of dazzling interior design. The modern kitchen should feel bright, airy, calm and well-ordered. Ideally it should have an open plan layout and a variety of different seating areas which reflect its multi-purpose role, making the modern kitchen a place that's just as suitable for a quick breakfast or a relaxing coffee break as a sit-down dinner. Glossy granite worktops and sleek fitted units create a polished finish, but are also practical in that they are easy to wipe down and keep clean. Likewise, neutral tones and an avoidance of busy patterns all help to create a restful mood in the modern kitchen, but also mean that there is no place for dirt to hide. Creating a great modern kitchen isn't just about ordering the most expensive units and appliances, it's also about getting the layout right. Otherwise, no matter how large the budget, the kitchen will feel awkward and poorly proportioned. Luckily, there are a number of rules of thumb that can help with modern kitchenplanning. First off, think about creating a working triangle —that's to say, the sink, cooker and fridge should all be placed within easy reach of each other. 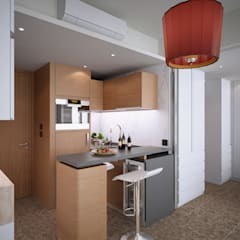 There are also several basic modern kitchen layouts to work with—galley layouts, L-shapes and U-shapes are all very popular. Many companies provide a 3D virtual kitchen planner to help homeowners visualize their designs. What will a modern kitchen cost? 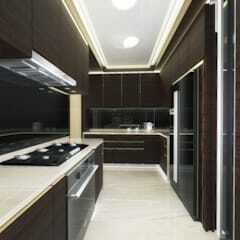 Of all the rooms in a property, the kitchen is likely to be one of the most expensive to renovate. That said, the exact cost will depend upon a number of variables. How big is the kitchen? The greater the square footage, the more costly your modern kitchen is likely to be. Is this going to be largely a DIY job, or will professional kitchen fitters be hired? Depending on the complexity of the work, the labour costs involved in installation, plumbing and wiring can take a significant chunk out of a budget for a modern kitchen. How high spec will this modern kitchen be? 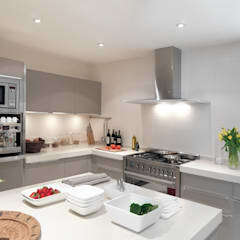 Top of the range worktops, units and appliances can cost at least three times as much as a basic kitchen. 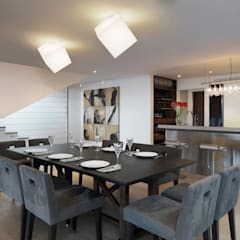 For more information, homify can connect homeowners with a whole host of professional designers and fitters who can offer advice on prices and budgets. What should I consider when buying a modern kitchen? 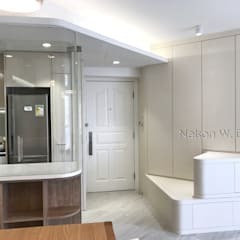 Because you won't want to be renovating your modern kitchen every few years, it's a good idea to choose a style that it isn't too faddish and that will stand the test of time, while also being easy to maintain. 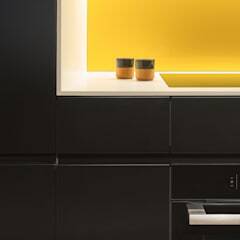 For example, highly polished black quartz worktops may be a must for many a modern kitchen, but they do have a tendency to show every thumbprint. 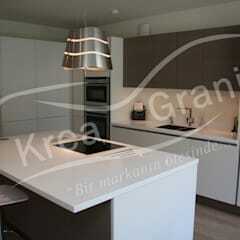 To achieve a luxury modern kitchen on a tight purse, there are various cheats than can be employed. It's possible to save money by opting for cheaper appliances and then hiding them inside cabinets, or by choosing inexpensive units then upgrading the doors and handles. When in doubt, keep things simple in your modern kitchen and think about the big picture, using smooth, uninterrupted runs of drawers or cupboards to create a visual rhythm that's pleasing to the eye. 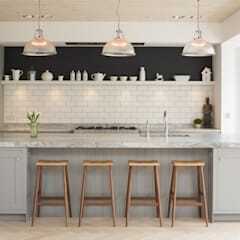 While still at the design stage, an important topic to consider is modern kitchen lighting. 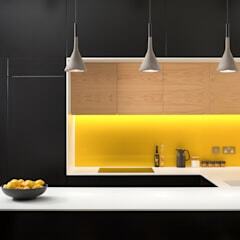 Downlights, directional lamps and strips of LEDs are just some of the multiple sources that can be used to create a subtle combination of task, accent and ambient lighting, perfect for defining the different zones of an open plan kitchen. 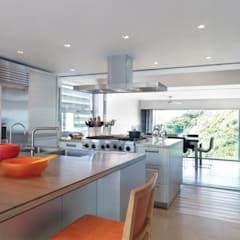 It's also wise to decide early on what appliances and modern kitchen accessories you wish to include—from essentials such as washing machines, dishwashers and fridge freezers to luxuries such as wine coolers and coffee machines—and then have them built into your modern kitchen design for a seamless, uncluttered look. Should my modern kitchen have a kitchen island? For rooms large enough to accommodate one, a kitchen island is something certainly worth considering. Not only are they a very striking feature, they also sum up the multitasking functions of the modern kitchen. 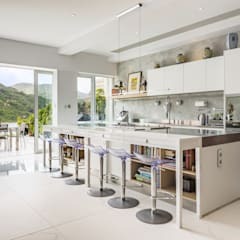 An island with a hob and power sockets for phones and tablets can make a marvellous focal point, a place where the homeowner can rustle up a meal while interacting with loved ones. 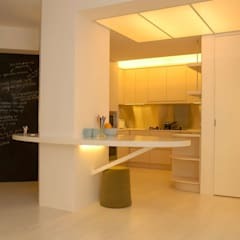 And when lit with a band of LEDs around the base, it can also look very beautiful in the evenings, adding greatly to the drama and visual impact of a modern kitchen. When it comes to small kitchen ideas, it's vital to make the best of the available space. 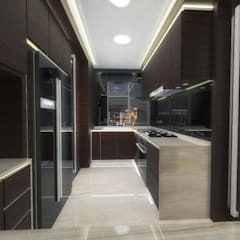 One option is to go for a galley design, with counters running down one or two sides of the kitchen, leaving a walkway in between. A bar stool can be tucked under one end of a counter to form a breakfast nook, with a separate dining table elsewhere in the apartment. 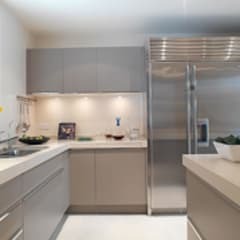 If a small modern kitchen still doesn't have enough storage, consider converting a closet into a separate pantry, and create maximum elbow room by placing appliances under counters and by using a sink cover when preparing elaborate meals. 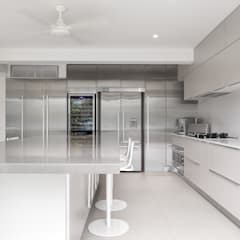 In terms of style, white walls and appliances with reflective metallic surfaces help to create a bright, open feeling to your petite modern kitchen, while recessed handles on cabinets and drawers provide a few extra centimetres of manoeuvring space. 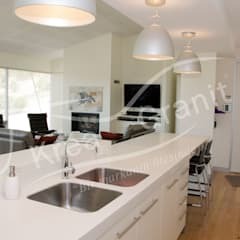 Kitchen worktops are one of the modern kitchen items that can vary the most in price, with a desirable quartz counter sometimes costing ten times as much as a laminate one the same size. For those with the budget, quartz or granite are extremely durable as well as exuding luxury. Solid wood worktops are similarly hard-wearing and over time blemishes can be sanded out. 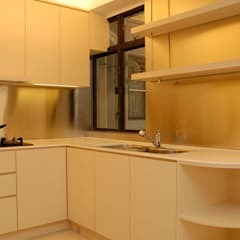 That said, there's no point in overspending on the perfect worktop if you then have to compensate by buying bargain basement units, as the resulting modern kitchen is still likely to look less than ideal. Also, while quartz and granite remain understandably popular for the modern kitchen, there are some attractive laminate alternatives that are well worth investigating. When buying a modern fitted kitchen, it's not necessary to splash out on a top brand, but bear in mind that not all cheap kitchens are value for money. 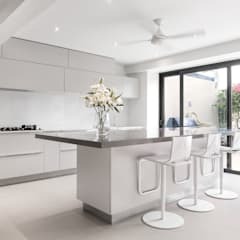 Modern kitchen units should be finished to a high standard inside and out, with no sign of corner-cutting, and be solidly constructed so that they won't seem jaded after a few years of use. Wherever possible, appliances should be integrated into the design of the modern kitchenrather than free-standing, as this can seem clunky and old-fashioned. 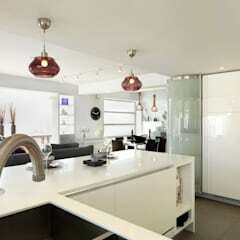 Overall, the best fitted modern kitchens tend to be those that are simple, elegant and intuitively laid out. 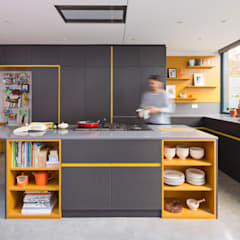 To learn more, there are a myriad of fitted kitchen ideas on homify. 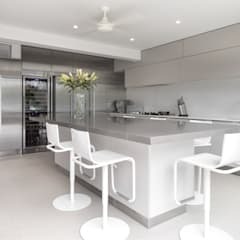 Although modern kitchen designs often tend to the sleek and monochrome, it's worth remembering that today's kitchen is a versatile space where all members of the family need to feel at home at different times of day. For this reason, it's desirable to have a choice of seating areas in your modern kitchen, from bar stools for quick, informal snacks, to a dining table for homework and evening meals, to a comfortable sofa for a lazy read of the morning newspaper. To keep the mood peaceful and welcoming even when all kinds of activities are going on in the kitchen, it's a good idea to invest in low-noise dishwashers and washer-dryers. 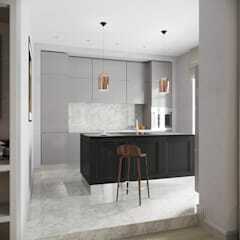 The minimal kitchen creates a strong impact through pure form and plain colour. 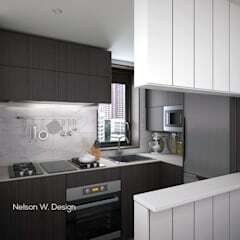 Surfaces are sleek and featureless, with hidden handles and appliances and everything stored away neatly. 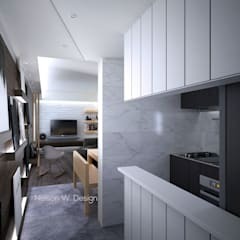 White, black and grey are the predominant tones, with the feeling of luxury coming through the refinement of the finish. A hard look to maintain in tip-top condition, this is very much a style for detail-orientated people dedicated to perfectionism. The rustic kitchen should feel cosy and comfortable, with a touch of shabby-chic. 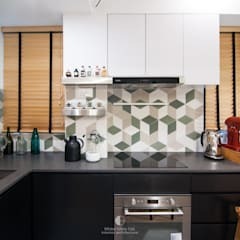 Walls can be exposed brick or covered in hard-wearing modern kitchen wallpaper, cabinets can have a distressed or reclaimed look, while appliances will often be free-standing and in a vintage style. An old-fashioned range, a sturdy oak table and chairs, a wood-burning stove, a Belfast sink or a Welsh dresser are ideal statement pieces for this look, while bowls of fruit, racks of pots and pans, vases of flowers and sprigs of dried herbs add the finishing touches. 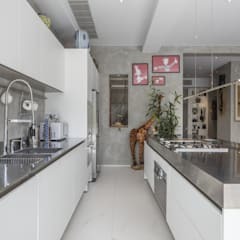 An industrial style kitchen shares elements with the modern and minimal styles, but the emphasis is on a mixture of rough and smooth, with the latest sleek worktops and appliances contrasted with bare brick and original architectural features. It's a style that works best in large spaces, where a sense of scale can be achieved with long runs of kitchen units and rows of pendant downlights. It's a tough, urban look, but also one that allows for some quirkiness, so that it's possible to bring an individual flair to the overall design with an eccentric choice of furnishings and accessories.